This is a nice cabinet door pull, all the same style and size, all made of cast brass, with the scoll & bead design highlight. These are designed to leave clearance for key passage through it or a escutcheon opening in the casting, so you can opperate the lock with a key up to .22" diameter (barrel key type) x .52" long slot. The pull is .75" x 3.62", and the mounting holes are 3.25" on center. Very nicely made handle pull overall, strong and solid. A good, sturdy, and nice looking cabinet door pull! Price is per each x the quantity shown in the quantity number listed. 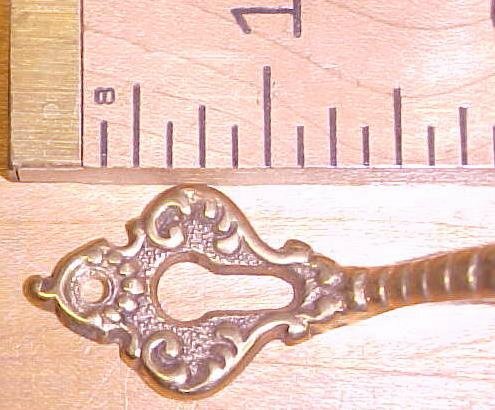 Items Similar To "Antique Door Pulls Ornate Hardware Brass Key Hole"